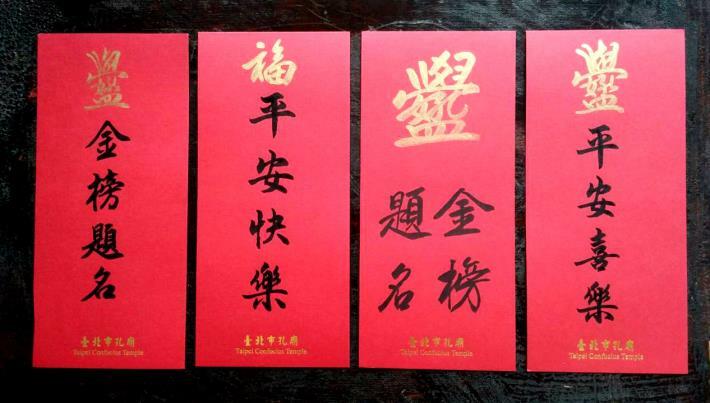 Taipei Confucius Temple distributes amazing calligraphy blessing cards to tourists at Yi Gate from 9:30 a.m. to 11:30 a.m. and from 2 p.m. and 4 p.m. every Tuesday through Friday; 10:00 a.m. to 12:00 a.m. and from 2:00 p.m. and 4:00 p.m. every weekend. This work of art is hand-made by calligraphers from R.O.C. Calligraphy Education Study Association to allow tourists to appreciate the beauty of calligraphic culture and have a wonderful memory. This event is hosted by experienced calligraphers from R.O.C. Calligraphy Education Study Association. They customize for tourist with greeting words on red blessing card. (e.g., Wish you success in your examination or May your study progress well.) Lan Shi-Cong, the Commissioner of Department of Civil Affairs, Taipei City Government, stated Chinese words represent the essence of Chinese culture and Chinese calligraphy contains the art of hand-writing Chinese words. Taipei Confucius Temple launches this regular Calligraphy event to promote and spread the beauty of Calligraphy and quintessence of national culture. We sincerely welcome people to join this event.